Nafas-22 is a photographic installation comprised of an inflated translucent plastic bag that is placed on a small metal shelf and a photograph showing an identical plastic bag, also inflated and cradled in the artist’s hands. The installation began with the artist’s round trip from Tetouan to Rabat, during which he inflated a plastic bag with his own breath, according to the places that evoke personal memories for him. 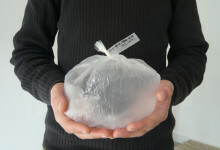 When he arrived at L’appartement 22 in Rabat, Younes Rahmoun sealed the bag, wrote the date and time on it, and took a photograph. When he returned, he repeated the action, which also concluded with a photograph. At L’appartement 22, Younes Rahmoun exhibited the first bag, a trace of his trip from Tetouan to Rabat, accompanied by the photograph that marked the end of the return trip.